Are there books you mean to finish? Can you even remember the plot? Some books are worth reselling on Amazon but you can usually find most anything you want in a charity shop for £1 or less. If it’s not been read, chances are it won’t get read – ditch it. Now is the time to say goodbye to those things you started and that make you feel bad for not finishing them. This will make room for something you can actually finish! As always this week, don’t choose anything that has a big resale value. 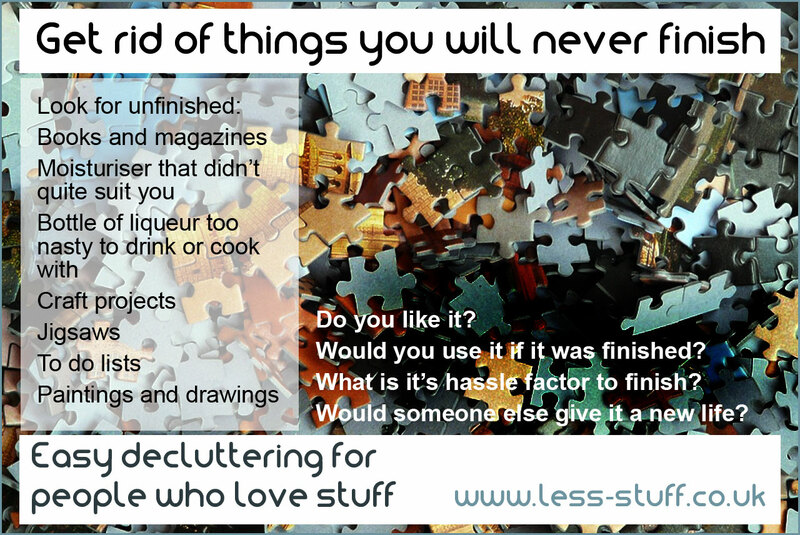 Choose things that nag you to get them finished. Would I use it if it was finished? What is it’s hassle factor to finish? Sometimes it’s good to give someone else a chance at finishing the thing you started. There truly are some people who would be really happy to find a couple of square feet of patchwork in a car boot sale or charity shop. Of course, if you really are going to finish something, today, this moment, not tomorrow because that never comes then stop doing this and finish your thing!